6th in a series on the Norwegian Fjord and Glacier self-guided tour from Authentic Scandinavia. As we booked extra days in Oslo, this was actually Day 9 and10 for us. Sometime during these 2 days was the moment I realized we were on the downward slide to heading home - a sad moment. Looking back over the time spent in Norway so far we had learnt and seen so much. It was a charmed trip right down to the weather which was always sunny exactly when we needed it, with only the occasional drizzle of rain to mix it up. Travel by bus from Bergen to Norheimsund. 3-hour cruise on the Hardangerfjord. 3 hours at leisure in Eidfjord. 30-minute cruise to Ulvik (arrival at 3 pm). Day at leisure in Ulvik until 3 pm. Travel by bus from Ulvik to Voss. 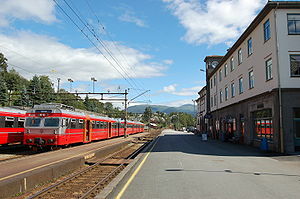 Bergen Railway from Voss to Oslo (arr. 10.30 pm). Day 9 we had to get up and out the door early. No way we could do justice to the buffet breakfast as 6:15 a.m., but we did our best. Then it was a quick hop by cab to the Bergen bus station. As much as we love to walk, it was too far towing suitcases and too early in the morning. I don't enjoy planes and buses. Fortunately this was only a short ride to my favourite transport - the express ferry - which we boarded in Norheimsund. Today we were cruising a new waterway - the Hardangerfjord. While the express boats on the Sognefjord were focused on transportation, this one gave us a more tourist oriented journey. We each received a brochure with map showing the route. All stops were numbered on the map with a paragraph on the history of each for those who wanted to know more. The Hardangerfjord is known for the numerous orchards seen along its banks. They are cultivated in straight lines down the vertical hillsides to the waterfront. It wasn't until we were off the boat walking among some of them that we realized how steep those slopes could be - some up to 35 degrees. Imagine riding a tractor up and down that incline and turning at the top and bottom. Probably the most beautiful display of orchards we saw was around the town of Lofthus. It was here that monks established the first orchards in the 1200's. Today the fields teem with cherries, apples, pears and plums. We had one 3 hour stop at the small town of Eidfjord. For those keen to see more there was a bus tour available that took you to the Hardangervidda Nature Centre and Voringfoss waterfall. Glen and I had no desire to sit on another bus and had already viewed several waterfalls, so opted to spend that time relaxing and walking in the town. 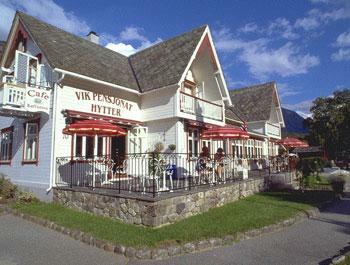 We headed up the hill and found a local just opening his cafe - the Vik Pensjonat Hytter. The question, "What do you have for lunch?" received one strong recommendation - a hot beef sandwich. Ensconced on the outside patio, we sipped a couple of pints of Hansa beer while enjoying the view and sunshine. The open-faced sandwich that arrived at our table was a delightful surprise and turned out to be one of my favourite meals in Norway. It started with a slice of toast. On top was layered carmelized onions, a seasoned beef patty, a slice of tomato, a leaf of lettuce, and then crowning all, a sunnyside up egg. This knife and fork meal was warm and satisfying - in other words PERFECT! I only wish I'd taken a picture. Relaxed and content, it was time for our favourite past time - exploring. With little guidance we began to walk around Eidsfjord. I took one picture - above - of an ambulance station. Why? Just another example of how the Norwegian word was sometimes eerily similar to the English word. We stumbled upon the Eidfjord Old Stone Church - a James church dated to 1309 - surrounded by a graveyard full of old headstones. The earliest we could read were from the 1800's. A few had become unreadable; others had been cleaned up or had new plawues put on them. We then found a dirt path to follow that meandered behind the homes. Small waterfalls were cascading down the hillside and there was the sound of the stream they fed into in the distance, but we never found it. Then it was back to the boat and our short hop across the fjord to Ulvik. From the Old Stone Church Graveyard. Ulvik was the town I found most beautiful on our trip. It was a mix of mountains, interesting buildings, orchards dotted on the hill sides (there are over 100 trees per person) and a beautiful rolling valley scattered with farms. After checking into the Rica Brakanes, we headed out to walk one of the upper roads for a bird's eye look at the area. The sun was shining and the view could only be described as bucolic. Ulvik is known not only for the orchards and farmyards, but for 3 local cider producers - the Hardanger Juice and Cider Factory, Syse Farm and Ulvik Fruit and Cideri. Unfortunately tours and tastings were by appointment only and we only had a half day today and a half day the next. I realized I missed mentioning one thing about Norway that was special. I LOVE Lilacs and they could be found in bloom city/town we visited, filling the air with their lovely scent. I grew up with them and the smell took me back to my childhood. Most were white or pale to mid-violet, but I found one bush in Ulvik that was vibrant deep tone. The photo below actually turned out lighter in hue than it was. Along with this are some random photos taken while walking around this area. but still has the sod roof. The barn has been left old and gray. Unusual roofing - right is old, the left is a type of tile we saw a lot. cabins. Would have loved to look inside one. Day 10 we only had until 3 p.m. this day and then had to catch a bus to the Voss Train Station. It was time to head back to Oslo. We woke up to clouds and light rain, so I decided to enjoy this last morning peacefully reading, walking and purchasing a few gifts. Glen headed to the tourism office after breakfast and rented a bike. Ulvik is such a wonderful place to ride that he spent a good 2 hours exploring. Then it was time to check out, have some lunch and fill the hour or so of dead space before the bus arrived. Our journey took an unexpected turn at this station. On the platform was a small gift shop that sold coffee. I went in, money in hand, to purchase 2 cups but noticed the last calendars I needed as gifts. Out came the passport wallet that held all important ID's and cards. I exchanged the 100 Kroner note for a credit card and set down the wallet. Then I was distracted adding sugar and creams to the coffees, stuffing the calendars under my arm and trying to get everything out to the platform. Somewhere in the confusion I left the wallet on the counter. The trip back scenery wise was a repeat of the trip before although cloudier, but I did remember to snap a shot of those isolated cabins up in the show zone. I didn't realize it until just before we arrived in Oslo that I had left everything behind. are the reason it isn't clearer, but you get the idea. We had one more day in Oslo before I had to get on a plane and no passport or picture ID to show. As we checked back into the Thon Opera Hotel, we were both dreading the next day. Despite the wonderfully comfortable bed and the scalding hot soak in the room's enormous tub to try and help me relax, neither of us slept well that night as we worried about the unknowns we would face.